The Historic Town of Halifax truly rocked the Roanoke Valley and has been doing so since the town was founded in 1757! The Town of Halifax is still the county seat for Halifax County. Today the town offers the Halifax State Historic Site, a Roanoke River Partners camping platform, a one-block business district with art/antique shops, and many historic homes and churches, as well as county offices, including the Halifax County Library. The town and historic site support several events annually, including Halifax Day on April 12, the First for Freedom historic outdoor drama, the July 4th celebration and fireworks, and Christmas in Halifax. The Halifax rockfish, painted by Tina Gregory, depicts the town’s nationally significant history with a portion of the Halifax Resolves, the first official declaration of independence from England by any colony adopted on April 12, 1776, on one side of the fish, and an original map of the town on the other. The fish is located in front of Town Hall on King Street. Artist Tina Gregory said she was inspired by the Halifax Resolves, the aggressions suffered by the colonists, and their amazing sacrifices made in the name of freedom. Carl Burke of the historic site expressed that Historic Halifax is proud to be a part of this important tourism initiative. 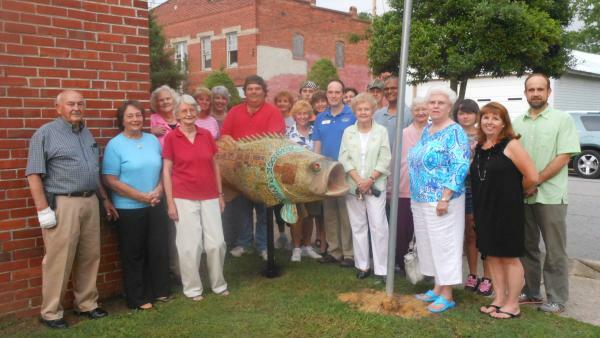 Mayor John White appreciated the historical significance of the fish’s design. Ginny Orvedahl of Preservation Halifax expressed gratitude to the Halifax County CVB for efforts across the county to enhance the experiences that visitors have here.